Exciting news! Willow designed her own t-shirt! The pop-art inspired tee is available for 2 weeks only. 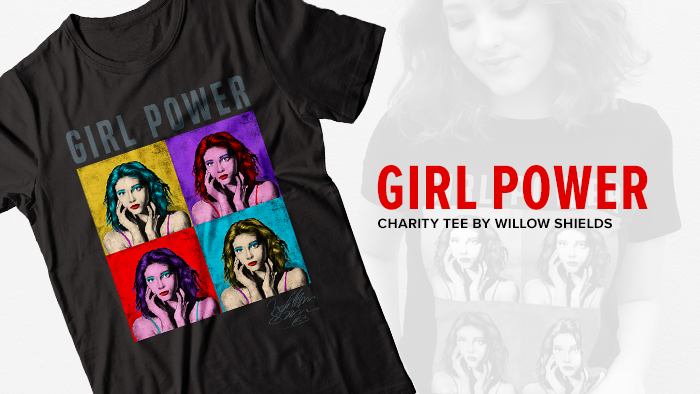 A portion of the proceeds will benefit Girls Inc, inspiring all girls to be strong, smart, and bold. The first 10 people to buy and take a photo in the shirt will get a direct message from Willow herself! More prizes will be announced soon. So go ahead, get yours at www.represent.com/willow/. EDITED TO ADD: Willow will now be DMing random fans who take a photo of themselves wearing the shirt, not just the first 10. Hi everyone! I have added high quality screencaptures of Willow as Prim in The Hunger Games: Mockingjay Part 2. Big thank you to negasonicaps! I have quite the update tonight. To celebrate and thank her fans for her 1 million followers on Instagram, Willow decided to face her fear of heights by jumping 630 feet off The SkyTower in Auckland, New Zealand. Lucky for us, she captured it all on video. Way to go, Willow! Willow is the cover star of the November 2015 isssue of New Mexico Entertainment magazine. Her spread features a new interview where she talks about growing up in New Mexico, filming Mockingjay Part 2, and of course, where she sees herself in the future. Not to mention beautiful photography by Keith Cotton. Click the image below to read the full story!